This has been the first week of worksession at our own African Glyndebourn in Togbin. And today is our first day off. Sofar we touched on the dramatic and musical aspects of all the scenes. From tomorrow onwards, the proper stage-rehearsels will start, together with the musical preparation. Floris (my collaborator on this project) and me are staying in an African-run auberge not far from the school. Each morning we climb onto one of the many motorcycle taxis and have a quite bumpy but cool trip to the school. There all of us share breakfast, lunch and diner. We keep to a schedule with a long break during the hottest part of the day. All 7 students live at the EITB, which allows us to work whenever we want. 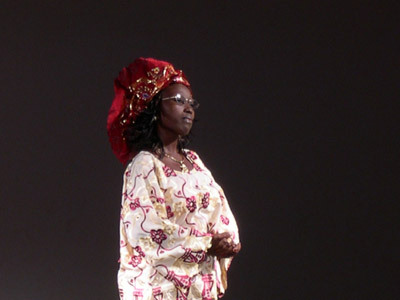 My group (2 women, 5 men) is a splendid, eager and talented collection of individuals from Benin, Togo and Niger. They have a very strong sense of belonging together and are very aware of their (traditional) background. That makes the work fascinating, but sometimes also confusing. The first I gave an introduction to classical, European opera with musical fragments from Monteverdi and Mozart. In this tropical context especially the classical singing sounded very alien compared to their own musical background. But by the end of the first week, during the 3-day workshop on classical singing given by Alexander Oliver, they produced wonderful sounds. They let their teacher slightly confused, as they used their voices in technically more or less correct way, whenever they perform their own repertoire. For the purpose of our Mme Paradji, Fidèle and Patrice, two of the students, overwhelmed us with their vast repertoire of traditional songs in Fon, the lingua franca of Bénin. They gave a concert lasting over an hour and told us at the end that they would need two weeks to sing everything. Floris and me reworked José Pliya's text to fit it to our own musical-dramatic purposes. At the first reading the students were quite impressed by the profound content and the distinguished writing. The musical arrangements of Angelique Kidjo's music will be provided by DagJack, who will also participate in the performance as guitar-player. As I'm writing this he is busy putting Josés' words to Angeliques' music. All is going well. I'm eagerly looking forward to the coming weeks. The last day of our working week we all went to visit the Nana Benz stalls at Cotonou's Dantokpa market. The Nanas Benz are the very rich tradeswomen who sell their goods in a very well organised and ventilated building in the middle of the sprawling market. We encountered several of them who could serve as an example for three of the roles in our opera. The bargaining over a piece of cloth, woven in tradiotional stripweave technique, was hard. In the end Tina and Nathalie (the girls in the group - of course) obtained a good price and the cloth is now spread across my hotel room table. In the afternoon we held a run through that lasted for 45 minutes, at least 15 minutes too long. I am not quite satisfied with the first part of the piece. 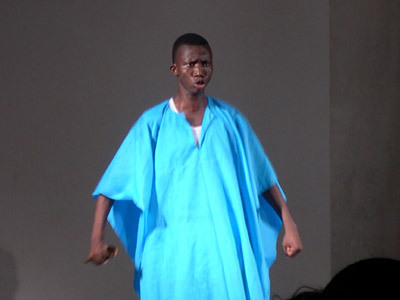 It consists of a series of six monologues, eye witness accounts of the youth of Mme Paradji, the central person in the piece. 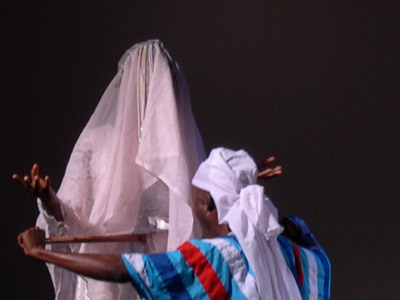 She is a legendary Nana Benz, reported to be one of the most powerful in West Africa. Next week I will try out a new order for this section. The scene introducing the second main character, the journalist Thimothee Kpade, is shaping up nicely. I can hardly wait to start on the last scene. Mme Partadji and Timothee meet eachother in a long and dramatic confrontation, that ends with timothee's death, poisoned by Mme Paradji. After a visit to the Centre Culturel Francais, where the opera will open on April 28th, we decided to play in la Pailotte. The huge open air stage did not seem fit for our piece. I am convinced that the opera needs a kind of intimacy to drive home to the audience the subtleties and derails of the acting. Today I am discussing the arrangements of Angelique Kidjo's music with DagJack. The musical rehearsels will start from tomorrow onwards. We are all looking forward to start this part of the work. This will allows us to get a good view on what the whole will going to look and sound like. Freerk Bos has arrived yesterday, carrying a load of video equipment with him. He will record the process and the performances. My collaborator Floris is quite pleased to hand over the camera to him. Jose wrote a nice and encouraging e-mail; he is not upset at all about the (sometimes big) cuts and changes we made in his text. The coming week I will try to get the first rough version of the whole play, with the music and the songs. Until now I am still on schedule, even with the African time. A week before the first performance and the scenes are becoming more and more developped. All the musical arrangements are ready and this week Dag Jack, le chef d'orchestre, will attend the rehearsels every day. In the meantime the costumes are made and the backyard of the school is transformed into the theatre for the first performance. Everyone is getting exited and nervous. Last week we worked on all the scenes to find their right colour and energy. In the afternoons the actors rehearsed the songs with Dag Jack. The first song in the performance will probably become a number one hit as everybody on the project is already humming and singing the tune over and over again. It sticks. The actors are working very hard. And it is interesting to see the differences with Dutch or European actors. On stage they are primarily expressing themselves through the text and find it difficult to stick to the text but at the same express something else psysically. It is not that they do not know how to use their physique. When they are performing their own traditional songs and dances they are perfectly able to combine these elements in perfect harmony. Sandy noticed something very similar when working on vocal technique: when they sing their own songs, there are no vocal restrictions, but when they are asked to produce singing sounds conciously all of them forget how to breath and find the right tone. Floris is doing physical exercises with them every morning and that helps to make them more aware. Another difference seems to be the method of rehearsing. They are used to doing run throughs from an early stage in the rehearsel period. The group was quite dissapointed last Saturday when I cancelled the anounced run through, as I thought they were not ready yet. But, very unlike the Dutch tradition, the director's decision is never questioned. Last week the actor and photographer Freerk Bos joined us. He will make an impression on video of the project and a registration of the performance. The last couple of days he followed the rehearsels and has made a start with editing the rough material. Next to his audio-visual work he is coaching the actors. Ibrahim has to play a drunken Dutch merchant and I am sure that Freerk can give him some advice. On Thursday Pieter Blusse, the secretary of the Dutch Embassy, came to the rehearsel. The actors suddenly did their very best and Pieter was impressed with the musical work. It was nice to have a little audience and a reaction from someone who saw the scenes for the first time. We are going to try to organise an extra performance on Friday the 29th, especially for the Dutch Embassy. This week will consist of doing run throughs, working in detail on the scenes and of course a lot of production work. The costumes, the flyers, the invitations, a generator for the lights at the school, cocktails for the guests... Tomorrow I will propbably do a run through of the whole play. That will give me the oppertunity to get a view on the whole and to see how the very different pieces fit together. The last week of rehearsals has been finished by a first run-through this morning at the school in Togbin. We had planned to start at 8.00, but Jacques, our guitar-player, had run his motorcycle into a muddy patch and arrived at 9.30. The weather was clouded so we could continue our run without too much trouble, otherwise running the piece in the open air venue would have been too hard under the merciless African sun. The theatre is still under construction and the construction workers had to lay down their work in order to clear the stage for our run, but of course Dine Alougbine invited them to stay and watch the rehearsal, which luckily they did. The run went as was to be expected: rather unbalanced. Good moments, but the new setting and surroundings also made the (otherwise very stable) actors forget their lines. The last run in the studio however, yesterday, was a very solid and gripping one and left me with good hopes for further performances. Right at this moment, I should be working on the lighting, but there seem to be some technical problems because of the rain. Talking of which: a fierce thunderstorm last week left our bungalows shaking. Lightbulbs, fans and coffee-makers suffered damage but nothing out of the ordinary. The performers have developed a steady grip on their musical material, the majority of the costumes has been tailored (with Nathalie looking splendid in her Mme. Tankpinou role costume of rich yellow and red and Ibrahim (who is playing a Dutch fabric-dealer) looking very incongruous in his grey suit with shirt and tie. Alanda and Tina by now have developed their skills and insights in their roles and can be very moving in the long and confrontational final scene between Mme. Paradji and the journalist, who turns out to be her son. Freerk Bos has shot hours of video and digital acres of photo material. The building activities for the new theatre especially turns out to produce visual gems. My invincible collaborator Floris is at this very moment roaming the hectic, disorderly, noisy and incredibly polluted streets of the city searching for suitable opening night charms for everybody. The final countdown had begun and as ever at this stage, I'm assailed by fits of doubt and restless nights. Will the performance make an impact on the audience? Will they accept the different styles in the piece, both musically and dramatically? Have I made the right choices in Angelique's material? Have I understood the basic conflicts in the piece in the right way? In short: will we be able to move them? Shortly, Dine will arrive to talk through the last production details. 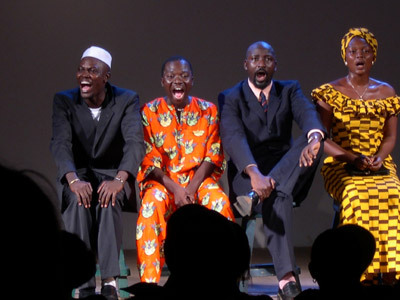 Before the actual beginning of the show, the Dutch Ambassador in Bénin officially opened the new theatre in Togbin, christened Théâtre de la Laitière, by revealing a plaque with its name. Opening night in Togbin had a dream-like quality. Accompanied by the sound of the surf in the background, we played to a wonderfully mixed audience of officials, invited guests, beninese artists and the nearby community of fishermen. The actors gave themselves completely and I think I can justly say that the audience was moved by the strong story and the honesty of the performances. My only regret was that José nor Angélique could be present at this unique moment. The evening was followed by a lively party in front of the EITB. I find it quite difficult to find better words for this magical occasion. Reading back these lines, I sound like a Hollywood reporter, while in fact it was so much more than a slick, "glamorous" or "fashionable" kind of thing: it was the creation of a piece of art in a very unlikely place to start with, and the most distinguishing aspect was the sheer honesty of the occasion. The day after we took a tourist break and visited the palaces-museum in Abomey, residence of the ancient kings of Dahomey. Wednesday we prepared for the next performance: at the Centre Culturel Français, where we played on thursday before an audience of mostly school children. I wasn't sure whether the young (14-16 year old) would appreciate the show, but in fact they liked it very much. Of course it was very different from the opening night. The rap-like number was greeted with huge enthousiasm and for a while I was afraid the audiences'energy would take over the show. The piece has been constructed as one big decrescendo and of course I was aware that I took a risk to present this kind of construction to a young audience. But in fact they followed the long final scene between Mme. Paradji and Timothée with exemplary attention. Of course, some of the subtlety was lost; the actors played up to the audience, that was unavoidable, but they didn't go for cheap effect. In the end I was very proud of them. On friday we had the last performance of this first series, and the first for a general audience. I have rarely been so moved by any actor as I have been on that occasion by my students. The intensity, the togetherness, the concentration led to a beautifully confident performance which left me a happy and melancholy man at the same time. After the show the cast invited my collaborator Floris on stage and thanked him especially. They had dedicated this last performance to him, as he would be leaving for Holland immediately after the show, (to their and mine and general regret). Saturday was spent on another tourist outing, the Route des Esclaves and the Monument at the Porte du Non-retour; it was my 5th visit to this place and every time I walk around it affects me deeply. A moment of contemplation on humanity, history, society and its injustices. Our beninese driver and me spent half an hour holding hands, watching this place of fate: just a beach on the Atlantic Ocean, and the stage of one of the major tragedies in humanity's history. Sunday afternoon we held our evaluation. A lot of beautiful and interesting things were said. And the general feeling was that we should now try and find a way to play our Madame Paradji to a wide audience in Africa and Europe. The actors wondered if the opera would be understood by an audience in Europe. I'm convinced myself that, given the right introduction, the piece will speak for itself to any audience. I'm back in Holland right now, writing this last report, but my soul still remains of africana soil.